The SOFT bristle is composed of 62% Castor Bean Oil, 38% plastic. This is the latest and most advanced bio-based bristle in the world today. Prior to the invention of nylon in the 1930s, pig hair was used for toothbrush bristles worldwide. Today, pig hair remains the only biodegradable option – and it is a very controversial material. We hope you’ll support our brand as we “vote” with our supply chain. Our product is BPA-Free, Vegan, and Verified Non-toxic. 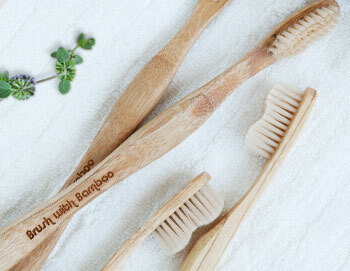 Brush with Bamboo is a USDA Certified Bio-based Product by United States Government’s Bio-preferred Program. 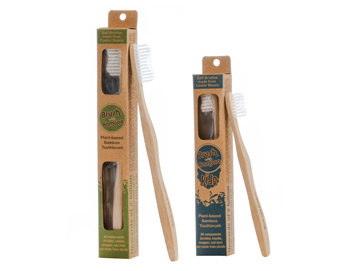 A purchase of our toothbrush is a vote for bio-based products that are not fossil fuel-based!